The mission of San Mateo County FC (SAL) is to utilize the sport of soccer as a vehicle through which to promote academic excellence, healthy choices, youth leadership and community involvement amongst economically disadvantaged and underserved youth in San Mateo County. San Mateo County FC (SAL) was started in 2009 by the San Mateo County Sheriff's Activities League (S.A.L.) not just as Soccer Club, but a community strategy that's members and families give back to their community, maintain good academic standing, receive leadership training and become role models to the younger recreational leagues that the S.A.L. program offers to the youth of Redwood City and North Fair Oaks. 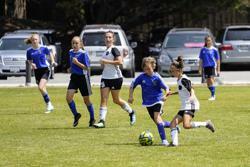 The San Mateo County FC offers the high quality training and coaching. Also with 35% of the youth in our target community being obese and 25% of the youth unable to pass the California Physical Fitness test, we are committed to keeping our kids healthy and active. San Mateo County FC evaluates all participants for physical fitness and works with them throughout the season to increase their fitness. All athletes are pre and post tested using the Presidential Fitness test as an evaluation tool.